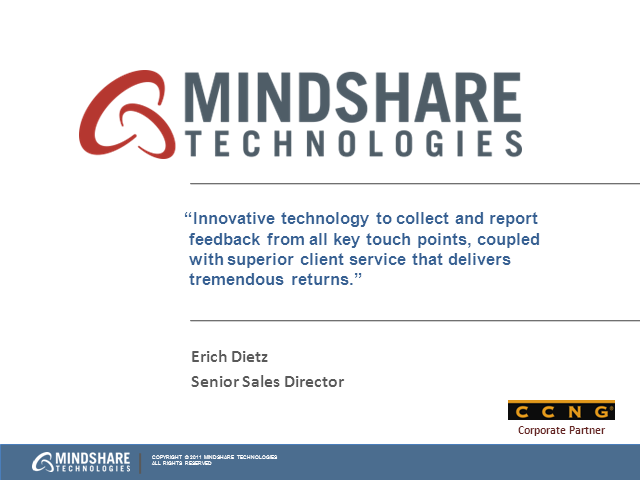 We invite you to join Erich Dietz, Senior Sales Director from Mindshare, as he reveals 4 major recent advances in Contact Center Customer Feedback. When happy customers become loyal customers they buy again, and they tell their friends. But you'll never know how they feel unless you ask them. And since the customer experience occurs at the unit level, that's where you need to measure it. Then allow those customers to become your teachers. Tap their feedback (positive and negative) and apply it to improving your operations. Immediately after a caller's service experience, customers respond to a short survey using their touch-tone phone, web browser, or mobile device. Customer voice and text comments are captured and played back from a web browser.